Last week, in honor of National Backyard Games week, we asked our readers to share outdoor games they invented as children. As we read through your wonderful responses, it became clear that children and adults have different definitions of what constitutes a "game." Unlike most adult-invented games, the games you shared all had elements of challenge but no obvious winners or losers. "We had a big willow tree in the backyard, on a hill surrounded by juniper bushes. We invented 'Frixening,' which required us to grab the willow tree branches and with a running start use them to swing out as far as we could over the prickly bushes without losing our grip and falling in. I have no idea where we got 'Frixening' from." "My little brother and I did all sorts of things with our swing set—but probably the greatest was when we could get our hands on the garden hose. We'd fill up the ditch under the swings with water, and wade around until it was good and muddy, then wrap the swings a couple times to get them to chest height and 'water ski' across the void. Many a good, filthy hour was spent that way. Getting hosed off by our mom before we were allowed inside was almost as fun as getting muddy." "As children, my best friends and I would often play 'Boss.' Using a disconnected telephone in the basement, we would take turns making up calls we received from the Boss telling us about missions we had to go on for work (of course, we all worked at the same place!). These included anything from having to sneak by Mom barefoot to searching for treasures in the small creek in our yard to riding our bikes through make-believe trails we created in the neighborhood—and named after our favorite candy!" Want to see more of our favorite outdoor games? 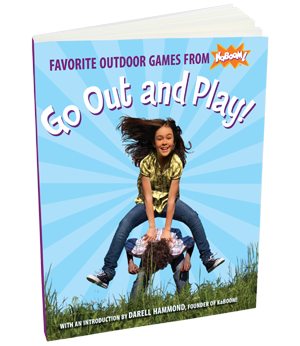 Donate $15 to get your own copy of Go Out and Play! Photo by Bill Dubreuil (cc).